The Sage is a two-story home that provides enough space for a growing family. This house design measures 3,428 square feet in total and presents 2,252 square feet of finished space. It includes a covered porch and a garage that can accommodate up to 3 cars. 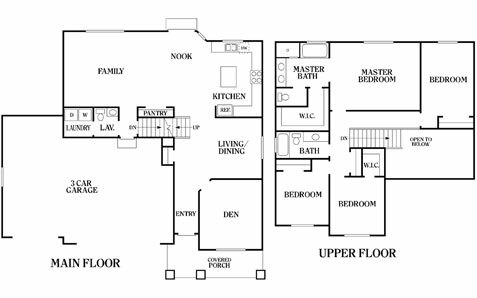 The first floor of the home features a large room where you can find an island kitchen, pantry, nook, and family area. Beside this space is a small room for doing laundry. The first floor also has a formal dining and living area and a separate room for the den. The second floor of the home has a master bedroom with its own full bath and a walk-in closet. The floor also has an indoor balcony that opens to the first floor, a shared bathroom, and 3 bedrooms, including 1 with its own walk-in closet. Perry Homes Utah has made it a goal to provide families with premium ranch-style houses at an affordable price range. Our house designs come with various options for customization, so you can make it truly your own. To help you in choosing the details of your house, we have design specialists who will walk you through every option available to you. In addition, we also have a selection of financing options for our clients. Start planning your family’s future house with Perry Homes Utah. Call us today to inquire about the Sage or any of our rambler and two-story homes. You may reach us through our Contact Us page or by calling 801-264-8800. Our customer service team will be able to provide you more information about our house plans and design and construction processes.